NASA’s TechEdSat 8 nanosatellite was one of five CubeSats released from a NanoRacks deployer outside the space station Jan. 31, joining other missions probing the ionosphere, conducting communications experiments, and providing hands-on experience for engineering students. Designed and developed by scientists, engineers and students at NASA’s Ames Research Center and San Jose State University, TechEdSat 8 is the latest in a series of miniature satellites validating technology and techniques for returning CubeSats and small sample canisters to Earth intact. An Exo-Brake — a square-shaped sail resembling a parachute that spans nearly a half-meter (20 inches) on a side — popped out of one end of TechEdSat 8 around 60 seconds after ejecting out of the NanoRacks deployer on the station’s Japanese robotic arm. The sail generates drag on the satellite as it speeds around Earth, using the rarefied atmosphere to slow down and drop altitude from the space station’s orbit more than 250 miles (400 kilometers) above the planet, without needing any propellant. Tensioning mechanisms on the TechEdSat 8 spacecraft, which measures around two-and-a-half feet (74 centimeters) long and is composed of six CubeSat “units,” will modulate the Exo-Brake, changing its surface area in an attempt to control how much drag the device generates. Engineers will use the modulating Exo-Brake to try to target where the spacecraft will re-enter the atmosphere. The Exo-Brake is comprised of a lightweight sandwich structure that the TechEdSat team is at Ames is seeking to patent, according to Marcus Murbach, TechEdSat 8’s principal investigator. Murbach told Spaceflight Now the TechEdSat 8 spacecraft is performing well in the early weeks of its mission. 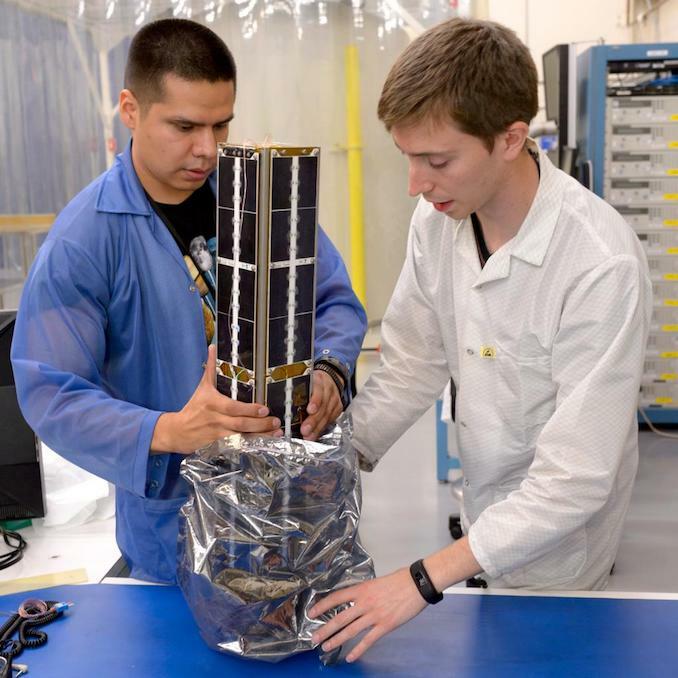 Ali Guarneros Luna, an aerospace and systems engineer at Ames, said TechEdSat 8 contacted controllers via the Iridium and Globalstar communications networks as planned shortly after its separation from the space station. In a response to written questions from Spaceflight Now, Guarneros Luna said the satellite is expected to fall back into the atmosphere in around six weeks, depending on the maneuvers attempted with the Exo-Brake decelerator, and changing solar activity, which can cause the atmosphere to balloon outward, producing more drag for spacecraft in low Earth orbit. TechEdSat 8’s predecessors in the TechEdSat series have experimented with increasingly complex maneuvers, and with larger satellites. 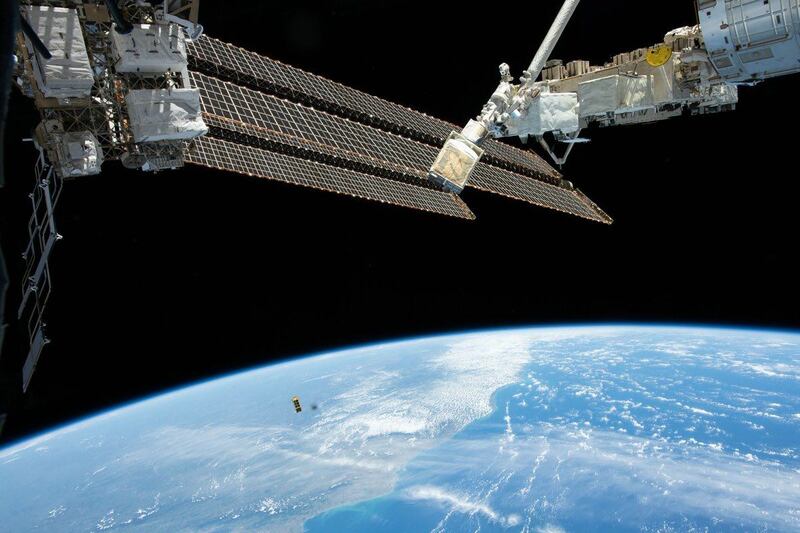 The first two TechEdSat missions used single-unit, or 1U, CubeSats about the size of a Rubik’s cube to test miniaturized email-based communications technology. Later TechEdSat missions began using larger, shoebox-sized 3U CubeSats in 2013, and introduced the Exo-Brake device. Murbach said engineers at Ames are still fine-tuning how to maneuver the Exo-Brake and more precisely target where the CubeSats will re-enter the atmosphere. The TechEdSat satellites deployed from the space station could re-enter the atmosphere anywhere between 51.6 degrees north and south latitude, a geographic area bounded by the station’s orbital inclination. “We typically target Wallops (Island in Virginia), which we did last time, with some success, though it over-shot without the final flare maneuver,” Murbach said. The Exo-Brake technology could be used for “on-demand” sample return from the International Space Station and other orbiting laboratories, according to NASA officials. SpaceX’s Dragon cargo capsule and the Russian Soyuz crew ferry ship are currently the only spacecraft in service capable of returning any specimens or hardware intact to Earth’s surface. The SpaceX Crew Dragon and Boeing CST-100 Starliner spacecraft, both designed for astronauts, will also have limited payload return capability when they begin flying later this year. But nanosatellites released from the station could return samples more often, at lower cost, and closer to research teams on the ground, reducing the time and effort required to recover the samples. NASA engineers also hope to apply technologies like the Exo-Brake tested on the TechEdSat missions to interplanetary micro-probes, such as tiny spacecraft that could reach the surface of Mars, enabling new research at the Red Planet at reduced cost. TechEdSat 8 also hosts several other experiments, including a radiation-tolerant circuit board and processor, and a plasma physics investigation. Several more TechEdSat satellites are in development at Ames, in cooperation with university students. TechEdSat 7, which is smaller than TechEdSat 8, is scheduled to launch on Virgin Orbit’s LauncherOne rocket later this year, and NASA has also selected the TechEdSat 10 mission for a future launch. 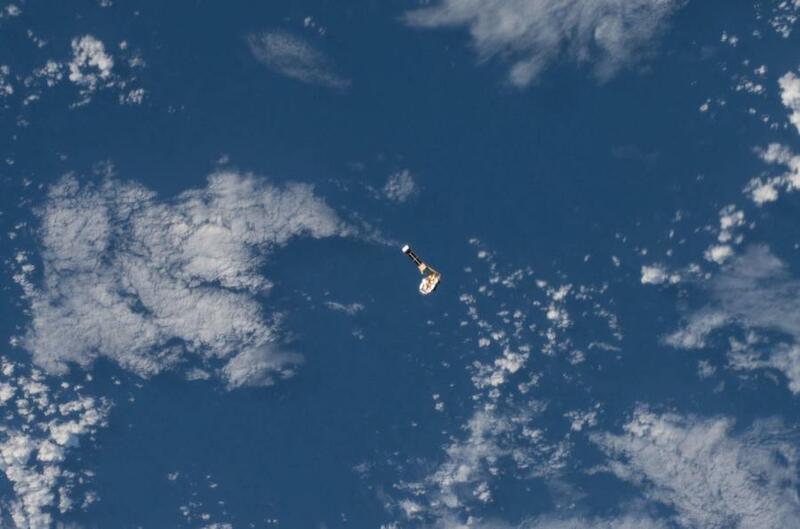 TechEdSat 8 was one of a batch of CubeSats deployed from the space station Jan. 31. The UNITE CubeSat, developed by students at the University of Southern Indiana, is part of NASA’s educational nanosatellite program. It carries instrumentation to measure plasma in the upper atmosphere. 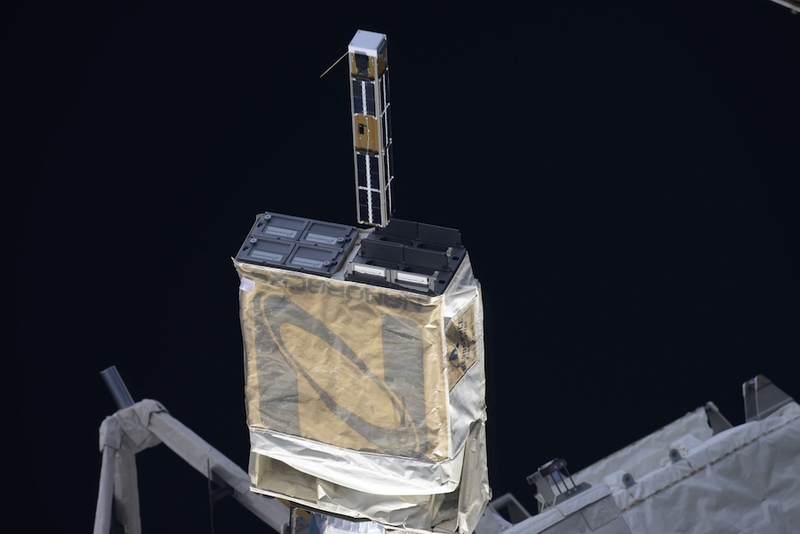 The CubeSat Assessment and Test mission — using two spacecraft named CAT 1 and CAT 2 — comes from the Johns Hopkins University Applied Physics Laboratory, with two commercial off-the-shelf spacecraft for a communications experiment in low Earth orbit. The Delphini 1 CubeSat from Aarhus University in Denmark was also released Jan. 31. TechEdSat 8, UNITE, CAT 1 and 2, and Delphini 1 were launched inside a SpaceX Dragon resupply ship in December, then mounted inside the NanoRacks deployer and transferred to the Japanese airlock by station astronauts. NanoRacks is a Houston-based company that offers launch and deployment services for small satellites. The company said it has deployed 190 CubeSats from the space station — and 228 small satellites overall — with the five new CubeSats released into orbit Jan. 31.